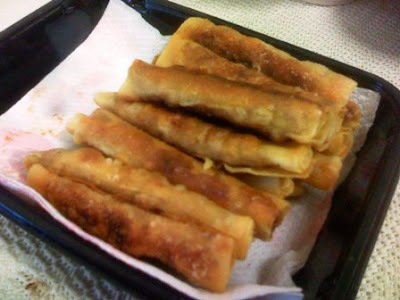 You might recognize the recipe as very similar to lumpiang shanghai (which I loooove so much!). And it is actually a take on the lumpiang shanghai. However, we cannot find lumpia wrappers at the Asian store and so we settled on using wanton wrappers instead. 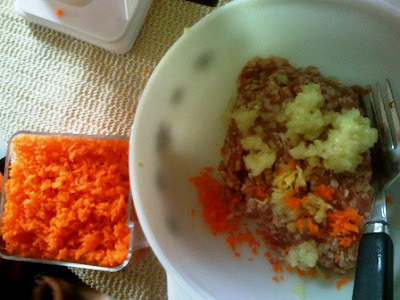 In a bowl, mix well together the ground meat, shredded carrot, garlic, spring onions, egg, salt, and pepper in a bowl using your hand. In each wanton wrapper, spread a thin layer of the mixture and roll. Do not be tempted to thickly apply it because we want to make sure the meat gets cooked properly, but the wrapper gets cooked quickly. 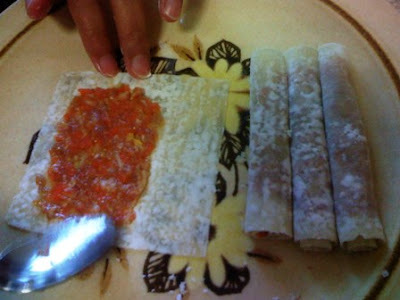 Roll it up, wetting the end with water to make it stick and close the mini lumpia. This is where your favorite movie comes in. You can watch while wrapping; it can take some time but you can divide your attention between the movie and wrapping because you know the movie already anyway and don't mind missing out some parts every once in a while. Heat up oil in a deep frying pan. When hot, reduce the heat to medium. Place the sticks side by side, making sure the oil engulfs the sticks. Brown all sides. Serve hot with either banana ketchup or Mang Tomas all-around sauce. Our verdict? The lumpia wrapper still works best with this recipe.